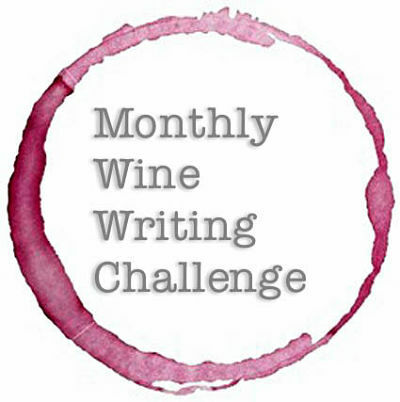 This is the first time I’ve entered the Monthly Wine Writing Challenge. The theme Solitude was chosen by last month’s winner Traveling Wine Chick. That was TWC’s prize, to pick the next theme. Does that tick some boxes? This isn’t the same blog post I started a few weeks ago. I’ve changed my theme several times. I’m a woman, I’m allowed. But that’s what solitude does for you. It gives you thinking time. This post has meandered along several themes (I’m now on Version 39) and I’m crazily writing right up to the deadline wire. I like it that way. Now look up. Yes, keep on looking up, above the #MWWC logo. See that picture at the top of this post? That beach? Those waves? That blue sky dotted with candy floss clouds? That’s a fine place for solitude that is, that’s Anglesey. If you’ve not heard of it before, then there you go you have now. If you’ve never been you should go. That there is my favourite beach and it’s called Lligwy Beach and me and the dog Millie aka The Moo spend lots of time there. It’s the best place for thinking time. I love it. Solitude of the finest order. I’ll try and hurry to the point and come back to Anglesey in a minute as I’ve also to tell you about a banana cake and a critical life-choice affirming moment for a wine lover. The Monthly Wine Writing Challenge theme then. Solitude …. and the reasons for all those blog post versions. 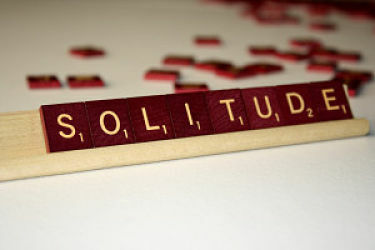 Solitude: It doesn’t mean being lonely, it means being alone. It doesn’t mean being sad, it can mean being happy. It can be a state of place; a state of mind; a state of peace. I feel pretty alone at the moment. Alone in my thoughts. I’ve already had two sets of tears today. 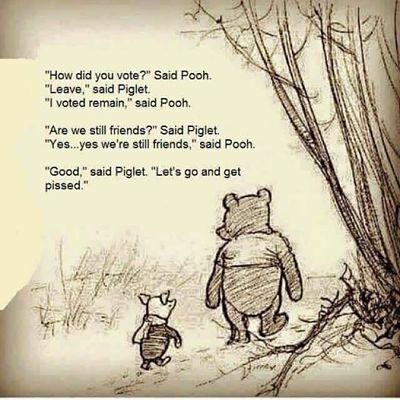 Yesterday – EU referendum result day – I was desperately desperately depressed. A majority voted to leave. Not all of Britain. Not me. I don’t want to leave. I don’t want to go anywhere. Penny for my thoughts now? It would cost you, as there’s too many of them. I’ve had lots of solitude the past 24 hours (lots of wine too, truth be told) and I ain’t happy and I certainly ain’t in a state of peace. I’m in a minority. A majority of my countrymen voted to leave the EU. I can’t get my head round it. Why? Why? For now it feels like a bad wine. Cloudy with aromas of fear and exclusion; with flavours of skimming the facts and a bitter aftertaste. And I can’t see that going away for a very long time. It’s a bad wine but the vote is the vote. That’s it. We have to drink it. We can’t go back and choose another wine because the door to the wine cellar is now truly shut and bolted. Basically, using the #MWWC26 theme as an excuse, I was Home Alone in solitude and having a right proper rant. I left this post unfinished for a couple of weeks, unpublished. I calmed down and had lots of thinking time (and drinking time). Now I’m back (Version 52) to nail my love of wine to the mast. Because when all else fails a glass of vino while rapidly typing out expressions of angst eases the pain and oils the vocabulary. 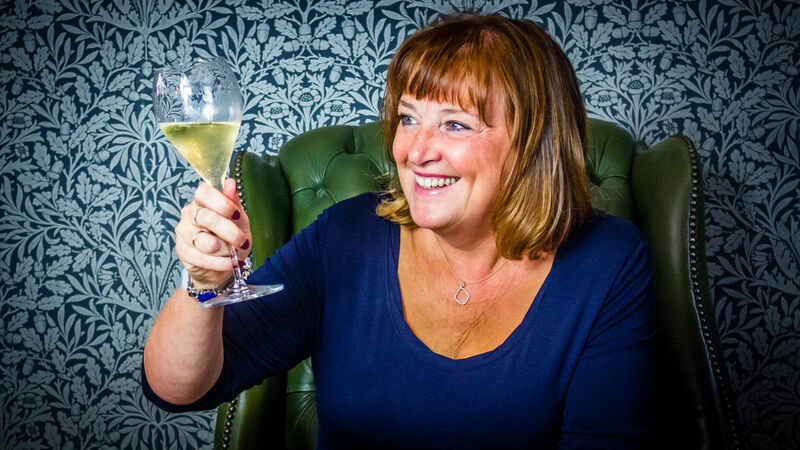 It’s too long a tale just now to tell you why and how I began a love affair with wine. It would take me up to Version 132 and none of us wants that and I have a deadline to hit. But I will tell you the tale of one day in April and that beach. And I’ll tell you the tale of one day at home this weekend just gone and a banana cake. Let’s preface this with you not feeling sorry for me because I’m not sorry for me. In April my role at work was made redundant. I’m OK now; another contract and in Proper Job terms everything is fine. So don’t worry. But in April I spent three weeks on Anglesey pondering the future. What would I do; how would my life pan out. I was on my own most of the time because in September my Better Half is fulfilling an ambition to cycle from Lands’ End to John o’Groats. So he needs lots of training time to practise cycling lots of miles and rightly so. 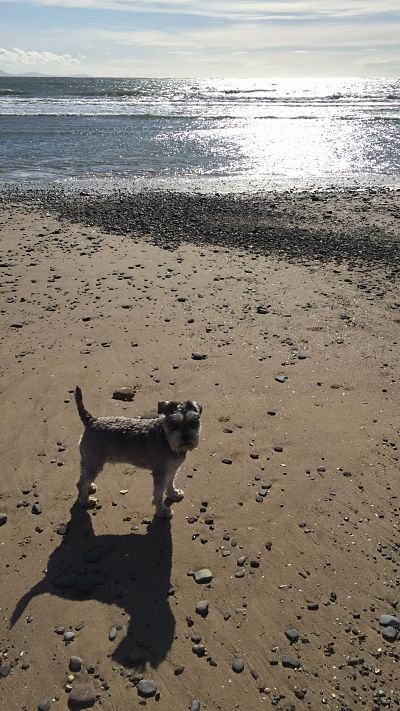 There we were, me and the Moo most days wandering from beautiful beach to beautiful beach and gazing across the sea. Sometimes. Just. Sitting. Above a cliff. Thinking. In solitude. We have a caravan on Anglesey (if you’re not from the UK then understanding the British and caravans would take me to Version 672 so I’m definitely not going there) and its our bolthole. We’ve been going for about four years to take deep breaths of an ancient air; gaze at the sea, the greenery, soak up the calm and enjoy wine … Yup many of my wine missives have been penned on the island where the Druids battled their final stand against the Romans. So this April, Anglesey and its solitude and its mind-opening, somewhat spiritual vibe was exactly what I wanted and needed. And then on the hill above Lligwy beach I realised that if all else failed I was lucky to have my wine. This could be my lifeline, my future, my income. I love it. Just love it. Next year, if contracts run out, I hope to throw my heart and soul into wine, setting up a small-scale business and studying the WSET diploma. That’s the confidence sitting above an Anglesey beach in solitude brings you. I’ve found wine and it has found me. It’s a lopsided arrangement because it can give me morning-after headaches whereas I just extol everything I love about it to everyone I know. The people, places, social history, geography, science, tastes, food, laughter. I’ll have a word with wine next time I see it about that one-way complimentary traffic on my part. I mentioned a banana cake. Last weekend I was a little bit poorly and not up to drinking wine. Ah. thinks me. I’ll try something else to fill my time. That something was to bake a cake; a banana cake. Because I had bananas doing nothing in the kitchen. Other fruits play crucial roles in my life such as gin dipping or sangria soaking. Bananas need yoghurt and I didn’t have any yoghurt. I didn’t take a picture of the banana cake before I threw it in the bin. But you just know when you’ve met your soulmate. Baking isn’t mine. Wine is. Let them eat cake, I say. I’ll wander up to my beach on Anglesey and shout up to those fluffy clouds that I bloody love wine. I’ve been giving it a lot of thought while I’ve been on my own.